I have bad winter photos to show you. Not being home very much when it’s light out makes it hard to share photos of knitting. 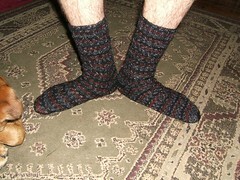 I have successfully finished another pair of Anthony socks. These were for the November Sock Knitters Anonymous challenge. The pattern is Rudy got Sole (pdf) and the yarn is Ditto. I got the yarn at Naked Sheep Shop in Portland Oregon. I did have some tangle issues with the first ball of yarn, but I have a feeling that was because I pulled out the end from the center badly. This pattern was a quick, easy and manly. I modified it by doing fewer pattern repeats and decreasing the number of stitches to 60 around the sock. Luckily Anthony’s feet are the same size as mine, so it’s always easy to figure out what will fit him. I’ve already started the December sock challenge, and have another bad photo to share. This was the Project Spectrum colorway I dyed in August for my Shop. The yarn is Strings and Yarn String Quartet Op. 130 – Beethoven. The colorway expired, so I get to keep it! I’m so excited because I haven’t really been able to knit with my own yarn yet. The pattern is Conwy by Nancy Bush from Knitting on the Road. 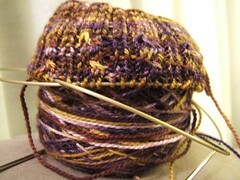 I had a great review of my sock yarn! Pam writes a great blog with reviews of many indie dyers. Check it out here. I’m almost done with Christmas knitting and after the holidays I’ll be sure to post pictures of all the goodies. I also still need a few sign ups for the Pay it Forward. Please let me know in the comments!